Symtech’s Megatron Solar Energy Battery System is an enclosed battery solution that incorporates proprietary battery management, communication, and control technology to provide maximum performance and battery life. 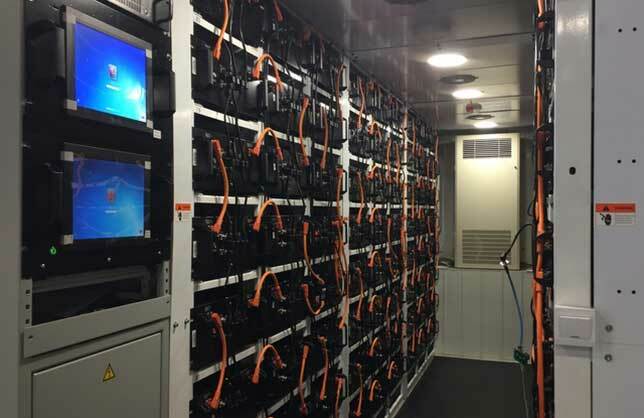 It is designed to be readily compatible with many power conversion systems and is an ideal platform for energy storage system integrator’s seeking to provide the most reliable and efficient turnkey energy storage solutions to the market. Applications of the Megatron include backup power, peak shaving, time of use bill management, frequency regulation, voltage support, renewable integration, and islanding. MEGATRON solar storage batteries can perform a wide variety of front of the meter, behind the meter, and micro grid applications to fulfill today’s energy storage requirements, but is designed to be flexible enough to be prepared for the future. Outdoor installations come in ±1MWh (20 foot) or 2MWh (40 foot) containers that have been optimized for ideal energy density with simplified maintenance access. Take comfort in your investment with Symtech’s solar energy battery systems. With industry advancing proprietary software that looks after your BESS the BMS (battery management system) system optimizes the efficiency of the entire unit down to the individual cells in each battery pack. Efficiency, safety and durability in energy storage. Megatron is the solar energy storage platform of the future. Megatron solar energy storage battery systems are a custom design and built solution. Each system will be equipt with site specific power hookups and safety features. Multiple configurations are available upon request. Please contact our technical service department for more information. Thank you for inquiring Megatron PV Kits!